THE SHARK IS A WINNER! If he doesn't start tomorrow, I will be stunned and upset because 1) I'm watching the game (which is against the Tigers!) and 2) because, like I just proved, the Shark is winner and the Nationals would be losers not to start him. Literally. 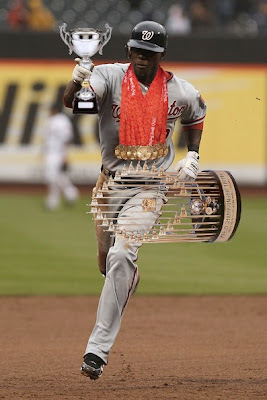 That could be the Nationals 2011 World Series Trophy in the Shark's hand.